Hillmorton Wharf, the site of a canal wharf, where vessels would have loaded and unloaded goods during the Imperial period. It was located on the east side of the canal between Kilsby Lane and the railway line. 1 The wharf at Hillmorton is shown on OS 25″. However, there are buildings and limekilns on the opposite bank and the wharf is shown unusually on the towpath side. 2 The wharf is actually on the other side on the canal, by the “Old Royal Oak” public house. The pub itself may be converted from warehousing – it is a large three storey structure. Its outbuildings appear to be connected with the canal. There is a short arm, now built on and used as a mantainance yard by a canal cruiser company. According to the 1901 census, my ancestor John Busby was a coal merchant living (and probably working) at 3 Hillmorton Wharf and other family members lived at 2 Hillmorton Wharf. He was still living there in 1911 but no longer working as a coal merchant but as a shepherd. Drive, pleasure grounds, pools, kitchen garden. A Methodist Chapel that was built during the Imperial period. It is marked on the Ordnance Survey map of 1905. The chapel is situated on Wesley Road, Hillmorton. The Parish Church of St John the Baptist. It was built during the Medieval Period, with later alterations through to the Imperial period. 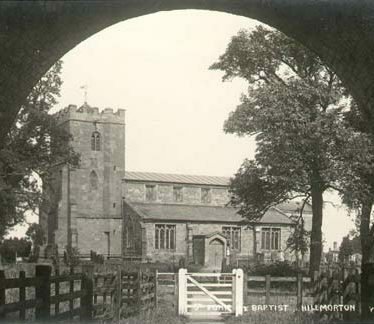 The church is situated in Hillmorton. The probable extent of the medieval settlement at Hillmorton based on the Ordnance Survey map of 1887. Stockton Locks, a flight of ten locks on the Warwick and Napton (Grand Union) Canal. A lock consists of a chamber with wooden gates at each end, with sluices used to lower and raise the water level of a canal. They were constructed in the Imperial period. The site of a canal wharf, where vessels would have loaded and unloaded goods, which was in use during the Imperial period. It was situated north east of Clarendon Street, Leamington Spa, and is marked on the Ordnance Survey map of 1886. A canal lock keepers cottage, dating to the Imperial period. It is marked on the Ordnance Survey map of 1926. It is located 600m west of Budbrooke. The site of a canal wharf, where vessels would have loaded and unloaded goods during the Imperial period. It was located immediately to the north east of Cuttle Bridge, and is marked on the Ordnance Survey map of 1886.